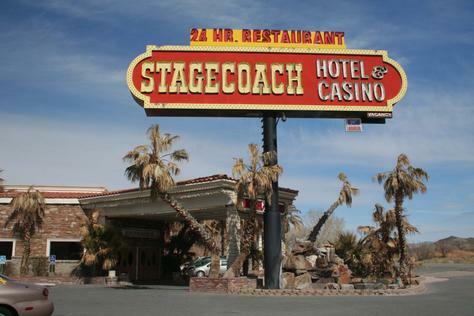 Stagecoach Hotel and Casino is situated in a small town Beatty, Nevada. Actually it is a census-designated place. But it does not make it less attractive. The hotel has 80 rooms and two restaurants Alexander's Steak House and Rita's CafÃ©. The casino is proud of over 200 slot machines and video poker machines and also there are 21 playing table for blackjack, craps, roulette, poker and roulette. The CDP is a gate to the Death Valley National Park. It even has a nickname "Gateway to Death Valley." The population, as of 2000 was a bit over 1,000 people. Everyone knows each other there. They had a mine, where a lot of the citizens worked, but in 1998 it was closed and the population decreased again. Although the CDP is a tiny spot on the map, it has Beatty Museum and Historical Society. It has always been a small place, but legalization of gambling in 1931 brought many visitors there. That is why there are many small towns that try to develop gambling industry there, as it is really profitable to involve all the citizens into the common business. You can also do the sports betting. The most popular table games here are blackjack, craps Big 6 and Texas Hold'em.